Market growers and serious hobby propagators will eventually find that they need a source of bottom heat to start seeds or to stimulate rooting. Bottom heat is an important factor in these two methods of propagation. Many seeds have a specific soil temperature in which they will germinate. And some plants will strike roots more readily when bottom heat is provided. In short, bottom heat can increase your success rates. There are commercial heat mats available that make this very easy. Some have a preset temperature range and provide 10° F to 20° F above ambient temperatures. Others can be fitted with a thermostats that will allow you to control the temperature as you choose. These mats come in a variety of sizes from a one-flat capacity to a four-flat capacity. Prices range from $17 - $250, thermostat not included. Heat mats and thermostats come in a variety of sizes and capacities. They are useful for small market operations and hobby growers. However, I found that I needed more space than these mats would allow. I could buy more than one mat, of course, but during tomato and pepper seed-starting season, I would have needed $1000 worth of mats. It didn't make economic sense to go that route. Then an idea struck - my daughter's old waterbed! It didn't take long for me to collect up the supplies we needed to create a heat mat on steroids. One that could be located in the greenhouse on a permanent basis. In the end, we built our heat mat for less than what one 4-flat heat mat and thermostat would have cost us. We used mostly new materials. If you had some of these materials on hand, the project would be even cheaper. You will occasionally find old water beds available at garage sales. You might not want to sleep on someone's old bed, but your seeds and plants won't mind a bit! The lumber does not have to be treated. It will not sit on the ground and it will not be exposed to wet conditions. The screws can be as simple as coarse threaded sheet rock screws. Nothing needs to be too complicated. The one thing to keep in mind as you chose supplies, especially of you are using scrap or repurposing items, is that water is HEAVY. Do not use materials that will not support the weight of the completed heat mat. A super-single waterbed is 48" x 84", which is measured on the INSIDE of the frame. Don't try measuring the mattress to calculate your dimensions. When they are empty, they are wider and longer than they are when they are filled. Lay out the (4) cut pieces. Screw the (2) 51" pieces to the ends of the (2) 84" pieces. You should use at least (4) screws per piece. This will result in a frame that measures 51" x 87". Check the frame for square. The dimension should be the same measured diagonally from corner to corner, both ways. Lay the squared up frame on the sheet of plywood and line up the outer edge of the frame with one end and side of the sheet. Use a pencil to trace the trim line outside the frame. Cut the plywood with a circular saw. Place the cut sheet back on the frame and screw it down all the way around. The screws should be placed every 8" - 9". Set the completed frame on the CMU blocks. You should support the frame at each corner, in two additional places along the long sides and in one additional place on the short ends. Attach the heater controls to the frame. We found that it was easiest to put one on each end since we located one heater in each end of the frame. It is important to exclude water at every layer and stage. We do not want water to sit in the frame, and we don't want the electrical controls to be drenched when we water. These next steps are to serve this purpose. Position the heaters - one on each end of the frame and centered. This will give the best heat distribution. Test them before the next step. Lay a sheet of plastic over the heaters and draped over the sides. The sheeting should drape past the woo d frame. Trim as required. Unfold and lay out the water bed bladder. Center it both ways. It will be larger than the inside of the frame. Don't worry; this extra space will be taken up as it fills. Fill the bladder. Follow any instructions that came with the bladder. This will probably include opening the vent so that air can flow out as water flows in. Filling will take some time, but you should stay close so you can monitor when the bladder gets close to being filled. 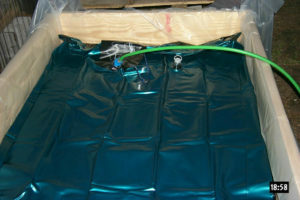 We do not want to overfill and have water leak into the plastic liner if it can be avoided. Your heat mat will be ready to use as soon as the water has heated. The first time in the season, it will take 16 - 24 hours for the water to heat. I set my thermostat to 100°F which gives me 85°F soil temperature. If I am starting seeds that require a little less, I put an extra flat under them. Plants should be placed on the mat in flats to give them a stable seat for watering and moving. I like to start tomato and pepper seedlings in community pots (com-pots). I use plastic sandwich boxes because they are cheap, easy to find, and just the right depth. 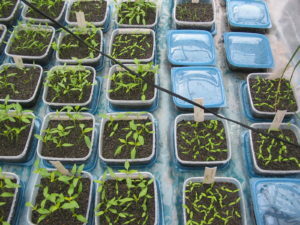 After planting and watering, I leave the lids on to hold in moisture and place them on the heat mat. I check every few days, and remove the lid before the seed leaves touch the inside. 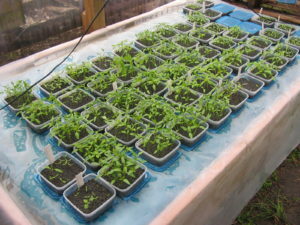 The seedlings remain on the mat until they are ready to bump up to 4" pots. Keep in mind that plants on heat mats will need watering more often since the heat increases evaporation. One bonus to this heat mat is that all waste heat is used in the greenhouse. Since we are using this mat from November through April, this works to our advantage. 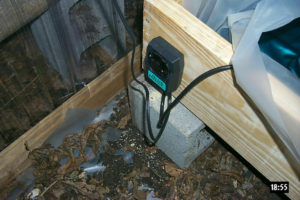 I have not had to use the propane heater since I set this system up in our 12' x 24' propagation house.